How do you know if you have an ingrown toenail? When do you see a podiatrist about an ingrown toenail? It’s the edge of a toenail that curves down into the skin. It can even pierce your skin and cause an infection. Often causing a lot of pain, discomfort and has to be treated by a doctor / podiatrist. If you’re diabetic or someone with poor circulation, it can cause severe infections and sometimes, gangrene. Toenails usually are normally flat with mild curving at the edges. Wearing tight shoes, genetics, fungal toenail infections, trauma and cutting nails too short are some of the reasons why a person can develop an ingrown toenail. Initial symptoms are mild pain while wearing tight shoes or with pressure. This can lead to swelling along the nail and redness. Eventually, infection develops and proud flesh forms. Proud flesh is a definite sign that the nail has pierced through the skin and must be dealt with right away. What if you don’t deal with your ingrown toenail? Recurrent infections cause scar tissue which leads to thickening of the skin/flesh around the toenail. This causes pain because now your toe is larger than it’s usual size and you’ll have to squeeze the toe inside a shoe. That’s no fun. Before seeing your podiatrist, a foot specialist, start soaking your foot with the ingrown nail in warm (not hot) water and dish soap. Yes, dish soap! Epsom salt is OK too but dish soap soaks help diminish bacteria. Your podiatrist will first anesthetize the toe. The portion of the nail that is incurvated is then avulsed and removed. At this point, if your toe is not infected, you may choose to have this portion of the nail removed permanently. A chemical is introduced into the nail bed that kills the matrix tissue. The matrix is what produces the nail. There is an approximate 95% chance that portion of the nail will not grow back again. 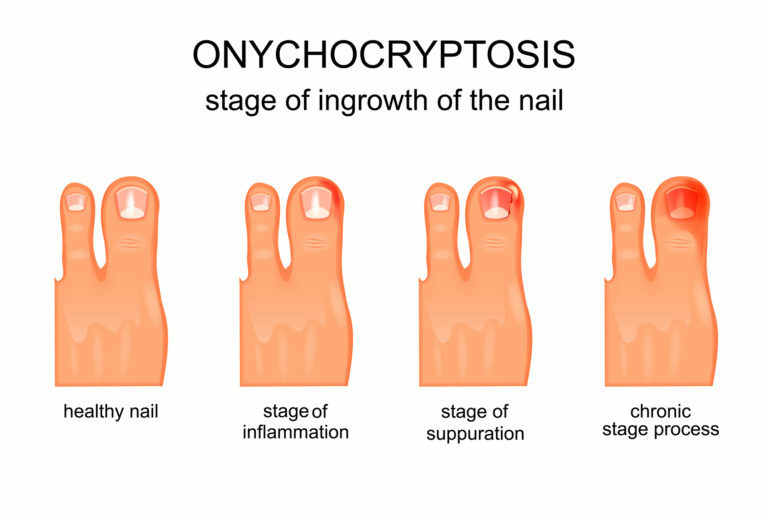 I highly recommend removing the ingrown nail permanently if it’s a recurrent problem for you. Most of my patients who have had their ingrown toenails removed permanently tell me they wished they had done it sooner because they have fussed with their nails for so long. Think of getting pedicures without the pedicurist digging in constantly. Think of having permanent pain relief from ingrown toenails. Think of permanent pain relief when wearing your cute shoes!